Ken Jarrett’s interest in fisheries biology began at an early age while fishing in the Sierras, the Central Valley, and in San Francisco Bay. He began his career in Alaska and has slowly worked his way south to California’s Central Coast. Although Ken works with many fish species, steelhead have captured his heart. 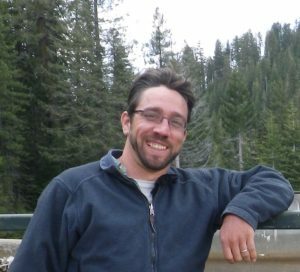 He is currently working in several Central Coast watersheds including the Salinas River, Santa Rosa Creek, San Luis Obispo Creek, and Chorro Creek. In his spare time, you can find Ken playing with his two daughters or fishing for lingcod from his kayak. Chorro Creek is the largest creek feeding Morro Bay. It begins in the hills behind the California Men’s Colony, flows under Highway 1 through Camp SLO and behind Questa College, then runs west along Highway 1 before entering Morro Bay under South Bay Boulevard. Chorro Creek is home to two federally listed aquatic species including steelhead (anadromous Onchorhynchus mykiss) and California red-legged frog (CRLF) (Rana draytonii). Unfortunately, Chorro Creek also supports a self-sustaining population of non-native Sacramento pikeminnow (Ptychocheilus grandis), which are known to eat juvenile steelhead and frogs. Juvenile steelhead in Chorro Creek, like this one, risk predation from non-native Sacramento pikeminnow. 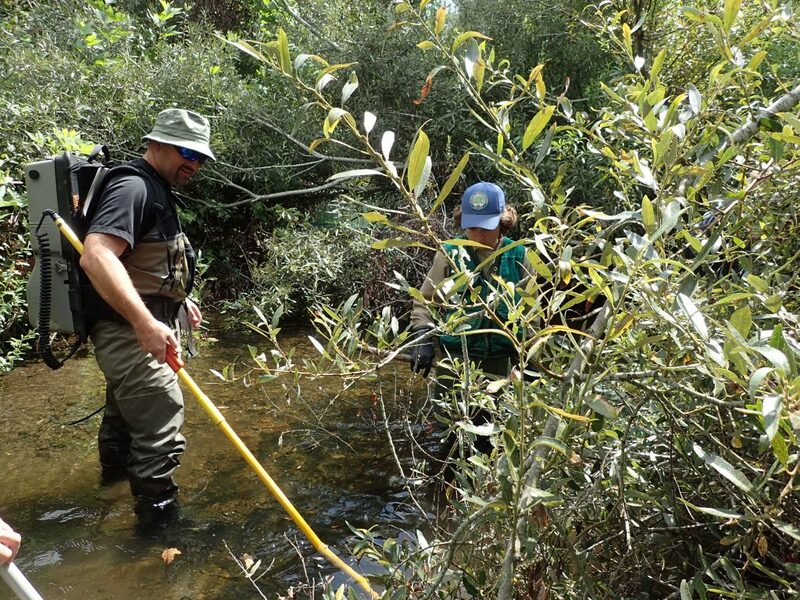 Great habitat conditions for steelhead are found in the Chorro Creek watershed. Choro Creek flows through the mainstem at a rate that allows fish to swim to a productive estuary (Morro Bay), dense vegetation that provides shade and nutrients for the stream, and a relatively small urban footprint. Although these habitat conditions are good for steelhead, the presence of pikeminnow in the Chorro Creek watershed is limiting the steelhead populations through direct predation and competition with juvenile steelhead for food and habitat. 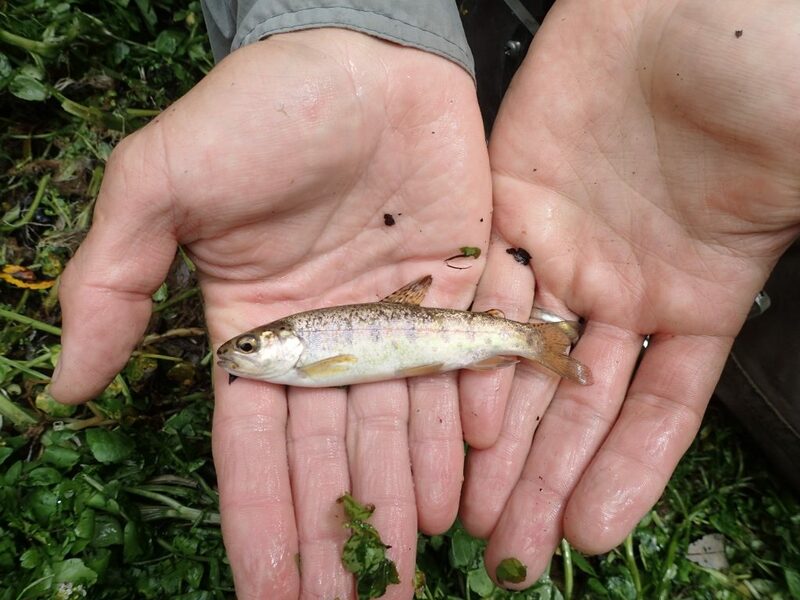 In a recent study, Morro Bay National Estuary Program and Stillwater Sciences conducted a detailed examination of the Sacramento pikeminnow to determine how many steelhead and California red-legged frogs are being consumed, and to determine what actions can be taken to help the native species in the watershed. To do this, we looked at the stomach contents of pikeminnow and analyzed DNA samples collected from their stomachs. This type of DNA sampling is often described as environmental DNA (eDNA) to indicate that the DNA is extracted from environmental samples such as water, soil, feces, or stomach samples as opposed to extracting the DNA directly from tissue of the target organism. We used angling, spearfishing, and backpack electrofishing to capture 39 large pikeminnow that were big enough to eat juvenile steelhead. After we looked at the stomach contents, we extracted DNA samples from the stomachs and sent them to the UC Santa Barbara Marine Sciences Lab for genetic analysis. There, researchers conducted genetic analysis using a technique called quantitative Polymerase Chain Reaction (qPCR) to detect steelhead and California red-legged frog DNA. 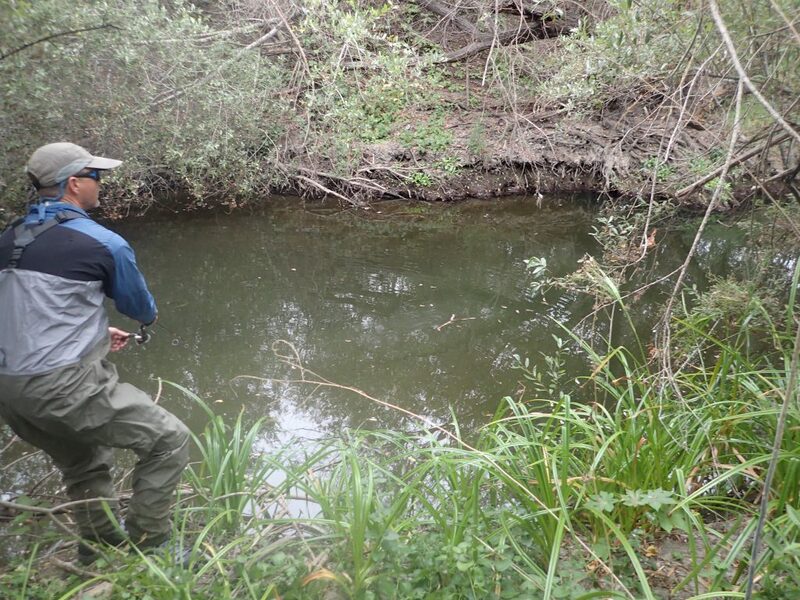 We used backpack electrofishing to monitor fish abundance in Chorro Creek. Most of the pikeminnow stomachs appeared to be empty, but the lab found steelhead DNA in almost 20% of the samples. No California Red legged frog DNA was found in any of the samples. Based on the DNA results and the reported digestion rates for pikeminnow, we estimated that each of the large predatory fish consumes around 40 juvenile steelhead per year. If the entire population of around 200 large pikeminnow in Chorro Creek has a similar predation rate, the estimated annual loss would be more than 7,000 juvenile steelhead. The bad news is that steelhead will never fully recover in the Chorro Creek watershed under this level of predation pressure. The good news is that every pikeminnow we remove from the watershed supports the protection and survival of 40 juvenile steelhead per year. For a fish that is a voracious predator for around three to four years of its life, the total protection of removing one pikeminnow is around 150 to 200 steelhead juveniles! The other good news is that we have a pretty good handle on the best methods to remove pikeminnow from Chorro Creek. In fact, after only one year of initiating efforts to reduce the pikeminnow population, we have seen a dramatic increase in steelhead numbers. 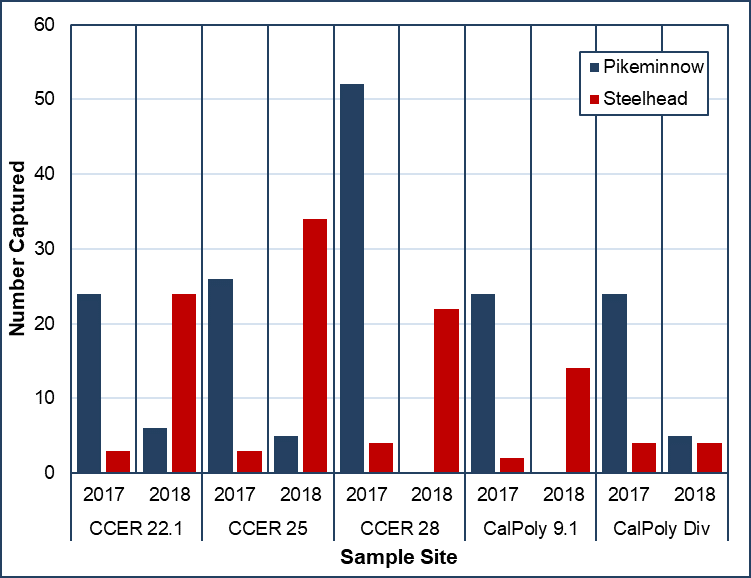 Locations in Chorro Creek where we conducted pikeminnow suppression efforts in 2017 had very high numbers of pikeminnow with very few steelhead at the time, but in 2018, the same locations had high numbers of steelhead and only a few pikeminnow. The Morro Bay National Estuary Program and Stillwater Sciences are hoping to secure funding to continue suppression efforts in Chorro Creek. 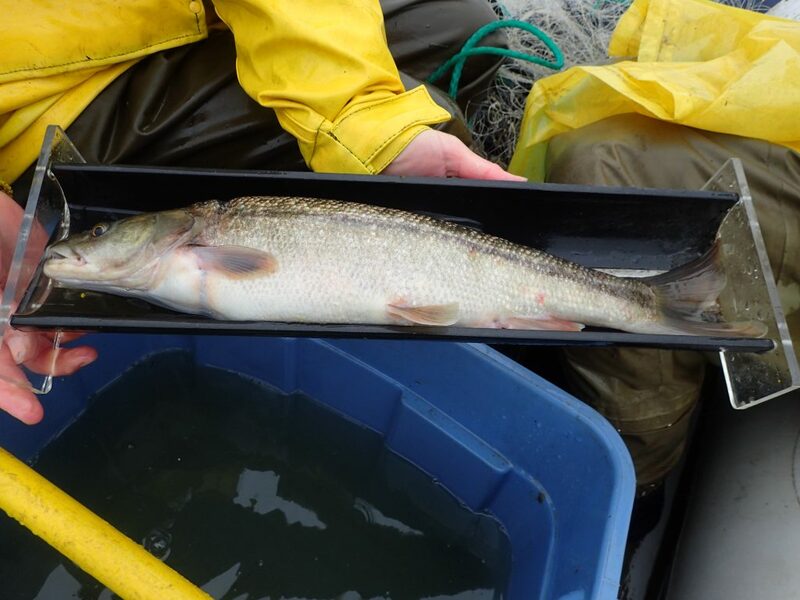 You can find additional details about this project in the Chorro Creek Pikeminnow Management Plan and the Chorro Creek Pikeminnow Predation Assessment for Chorro Creek Report in the Estuary Program’s online library. Come see S.L.O.P.E.’s show Flowing Estuary to Living Sea, at the Morro Bay State Park Natural History Museum now through March 31, 2019. A portion of proceeds from art sales will benefit the Morro Bay National Estuary Program and the Central Coast State Parks Association. We hope to see you there! Watch the video below for a preview of more artwork from the show.